Technological advances and structural changes within the electric utility industry mandate that protection engineers develop a solid understanding of the related new technologies as well as of power system operations and economics in order to function proficiently. 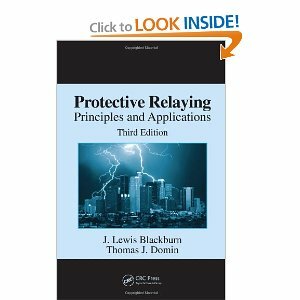 Continuing in the bestselling tradition of the previous editions by the late J. Lewis Blackburn, Protective Relaying: Principles and Applications, Third Edition retains the fundamentals of protection relays and power system protection while incorporating new developments in the field. Thoroughly updated and revised, this third edition focuses on technological changes in the design of protective systems, the practical concerns of power system protection encountered by users, and the techniques for protecting typical facilities used in modern power systems. Expanded coverage of the requirements for generator intertie protection, generator protection, and generator excitation systems. The latest technologies in microprocessor applications, including digital-based devices and designs. Protection issues, such as capacitor bank protection, underfrequency and undervoltage load shedding, special protection schemes, DC tripping scheme designs, fault location, and event reports. Building on the excellence of the preceding editions, this book will continue to serve as a basic reference for newcomers to the area as well as for experienced engineers. By sharing his first-hand experience with protection practices, the author offers valuable realistic insight into this field. PROTECTIVE RELAYING: PRINCIPLES AND APPLICATIONS FREE E-BOOK DOWNLOAD LINK!! !